Medicinal activated charcoal, sometimes known as activated carbon, is made by applying heat and steam to raw materials to produce a highly porous microstructure able to trap contaminants in gas or liquid form. Activated carbon is an effective treatment for a variety of indications that vary by country and can include diarrhea, poisoning, flatulence, bloating and heartburn. In fact, activated charcoal is listed on the World Health Organization’s (WHO) Model List of Essential Medicines as an antidote for non-specific poisonings. 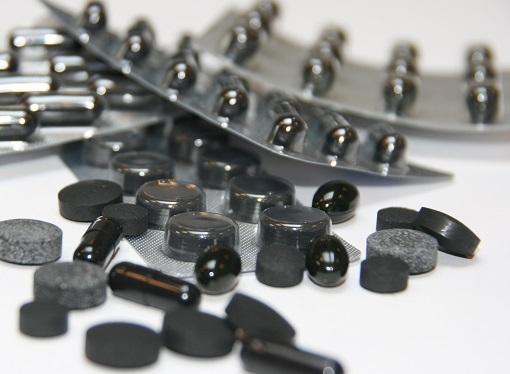 Our production of medicinal activated charcoal products, both our own registered products and contract manufacturing, takes place on dedicated production lines compliant with the regulations set forth by the United States Food & Drug Administration's Current Good Manufacturing Practices (cGMPs). With superior adsorptive power, our tablets, granules and capsules are highly effective agents for binding toxins and gasses from the gastro-intestinal tract. Diarrhea is caused by a variety of triggers such as food, medication, bacteria, or viral infections. Although very common, diarrhea is a serious health problem. Acute diarrhea can be treated with activated charcoal to purify the gut. Oral poisoning is commonly caused by medication overdose or the ingestion of fungus or other toxic substances. For many toxic substances, a proven and effective therapy is a high dosage of activated charcoal. Quick administration of activated charcoal can limit or prevent absorption of these toxic substances in the gastro-intestinal tract. Common causes for bloating and flatulence are excessive intestinal gas formation and accumulation. Excessive intestinal gas in healthy people can be connected to certain types of food or to incomplete digestion due to environmental factors, such as change in diet or physical exercise habits. Our activated charcoal can treat the cause in a natural way, releasing the gas bubbles and helping to adsorb the gas-producing substrate in the stomach and intestines.